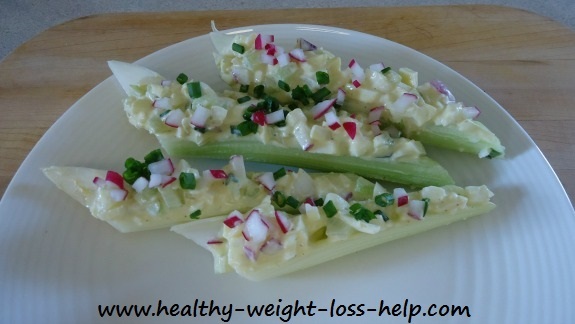 This egg salad recipe can be made on a shoestring budget. In fact, most meals made with eggs are a heaven sent when money is tight. This traditional recipe is well received by all ages as it offers a rich and creamy texture with little crispy crunchy tidbits of vegetables in it. Yummy. For this recipe we will use our favorite mayonnaise, which is Hellmans. 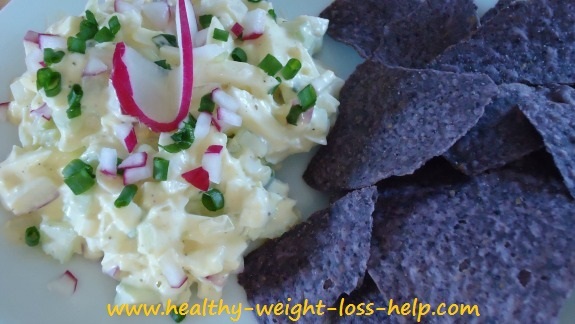 But you can also substitute the mayonnaise with yogurt to make this meal lower in calories. We will get to that a little further down the page. Once your eggs are cooled off, peeled and rinsed, chop them with an egg slicer or a knife, whichever one you have. I find an egg slicer chops the eggs just the right size and works faster. As in the picture above, I usually cut the eggs sideways first then lengthwise in the opposite direction. This is a nice size for this egg salad recipe. Place chopped eggs into a bowl. Now add all other ingredients, including salt and pepper to taste and mix well. Serve with bread or salad of your choice. Garnish with green onion slices or freshly chopped chives. If you are making an egg salad sandwich it is always wise to put a layer of lettuce on the top and bottom of the bread so you can sandwich the egg salad between the lettuce. This is important if you want to avoid a soggy sandwich. 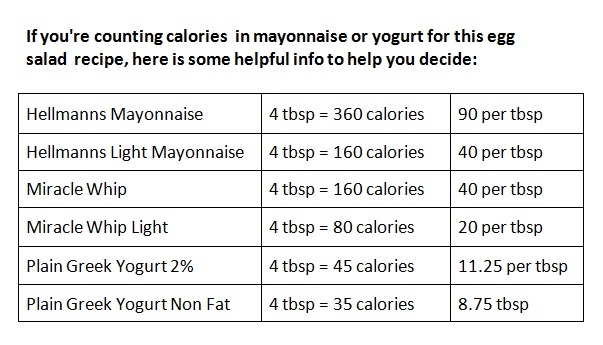 If you are counting calories then substitute the mayonnaise with low fat Greek yogurt (or do half mayo and half yogurt) to make it lower in calories. Why use Greek Yogurt? Even though all yogurts will make this salad a little watery and runny, using Greek yogurt is your best bet because it adds the least amount of water. 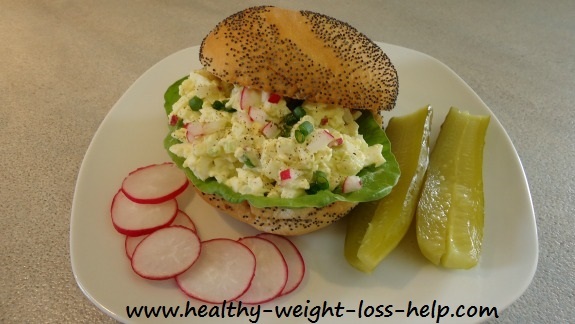 This egg salad recipe is a real life saver when you are running short on cash or can't get to the grocery store as most of us usually have eggs in the fridge.